The Bitterroot Valley man known as the “Montana Mountain Goat” because of his mountain climbing exploits – he’s topped 50 of the highest peaks in the United States including Mount Denali in Alaska, plus Mount Kilimanjaro in Africa, since he reached 70 years of age – has just released a book about his exploits as a climber. In fact, he’s climbed 48 of those 50 highest peaks twice, the exceptions being Denali and Mt. Gannett in Wyoming. Mario Locatelli, now 76, who lives near Hamilton in the Bitterroot Valley, tells his life story and includes several tales of his major climbing experiences in his new book, which is titled “The Mountain Goat Chronicles”. 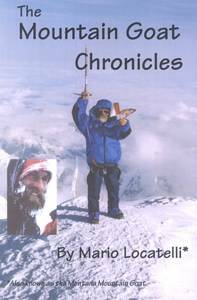 Included among the stories is the saga of his climb of Denali, where he was the oldest person ever to achieve that climb until recently when a Japanese man a year older than him reached the top of the mountain. 6x9-inch softcover format. Its 136 pages include numerous photographs, including a 16-page color section showing Mario and many of his friends atop mountain peaks ranging from several in the Bitterroot Mountains to Denali (Mt. McKinley) in Alaska, Mount Hood in Oregon, the Devil’s Tower and Gannett Peak in Wyoming, Mount Rainier and others in Washington, and such high points as Guadaluple Peak in Texas and Borah Peak in Idaho. The cover photograph on the book shows Mario celebrating his ascent to the top of Denali.